In a tavern off the coast of the Thames, locals come to hear stories and drink their troubles away. Some of them are about to play a part in a story that myths and legends are made from. A little girl is brought to the tavern saved by a man who happened to see her in the river. The man passes out from exhaustion and the girl is believed dead. After the local healer comes to aide the man and confirms the child’s fate. Even though the girl appears dead to the knowledgable healer she suddenly starts breathing. As the girl and man heal the hunt is on to find her family. The strange thing is 3 families want to claim her as theirs. One couple who lost their daughter 2 years ago, one widowed man searching for his young daughter, and one sister who thought she harmed her missed sister many years ago. 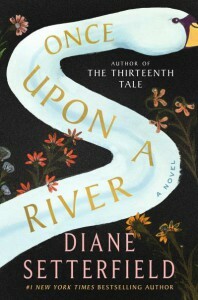 Told like an Irish fairy tale, Once Upon A River is a mystical tale of what can destruct a relationship and what can heal it. I loved this book from beginning to end. Anything told in a way that reminds me of an old Irish fairy tale will usually get high praise from me, especially if the story is not predictable. I thought as I started the book the time period it takes place in would only be in the intro to the story and the time period would fast forward to our time later. It does not. The book stays in the same time period throughout the book. Which for me added to the mystical side. The three families who believe the girl is their’s and who the girl really is or where she belongs is a big mystery until the end. The fact that I could not predict any of the storylines is a plus for me. When my brain works out what is going to happen next I get bored. Same happens with tv shows and movies for me too. I read Diane Setterfield first book The Thirteenth Tale. Everything in that first book that I wanted The Thirteenth Tale to be, is in this new book. I don’t any thoughts on how to make it better because Once Upon A River is best as it is. Diane Setterfield does have a mastery of words that I can not really figure out how one does write as she does. I am curious at what is next for this author. I could see a sequel or some of these characters popping up again in future books but that is not for me to decide.